Occupying the eastern half of New Guinea and its offshore islands, Papua New Guinea represents an immense cultural and biological diversity. Densely carpeted in lush rainforest, the largely mountainous interior includes several active volcanoes. Because of this rugged landscape, Papua New Guinea remains one of the planet's least explored areas, thought to harbor as-yet undiscovered species. Remote mountain ranges nurture unique plant and animal life found nowhere else in the world, while the wildly fluctuating topography creates large differences in climate that further diversify the ecosystems. The people of Papua New Guinea are equally varied and distinct, with hundreds of tribes and communities--the vast majority of which are rural--and approximately 850 different languages. 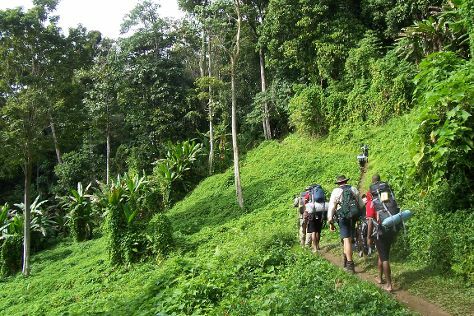 Don't expect much of a tourism infrastructure in Papua New Guinea (or infrastructure of any kind), but do expect any challenges to be richly rewarded by a real adventure unlike any other, in an untamed wilderness, untouched by commercialization. Papua New Guinea is in South Pacific. To personalize your trip to Papua New Guinea, create itinerary details specific to you using our Papua New Guinea trip planner.